House Industries is no stranger to educating Generation Next about the fundamentals of modernist design. (Case in point, the memory game and wooden puzzle are based on the work of Alexander Girard.) But if G is for Girard, then E most assuredly stands for Eames, another mid-century marquee name that the design house has distilled into a set of alphabet blocks — one that also pays tribute to Charles and Ray’s most famous abode. Individually, the blocks showcase letters, numerals, and symbols from House Industries’ Eames Century Modern font collection. 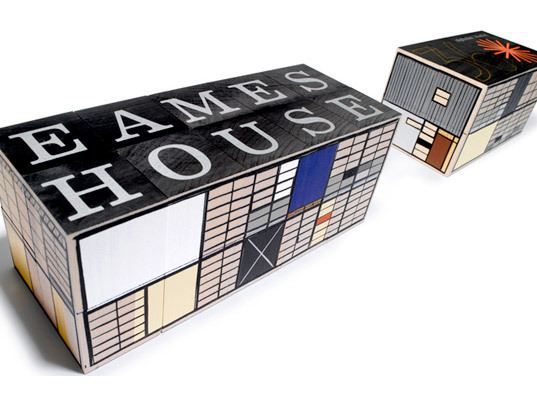 When pieced together like a puzzle, however, the blocks form a mini-facsimile of the Eames House (also known as Case Study House #8) and its adjacent studio, both of which sit atop the Pacific Palisades overlooking the ocean. Made in the United States from replenishable Michigan-grown basswood, the blocks are screen-printed by hand using non-toxic, lead-free inks. The result? A true work of art that has all the hallmarks of a modern classic. House Industries is no stranger to educating Generation Next about the fundamentals of modernist design. (Case in point, the memory game and wooden puzzle are based on the work of Alexander Girard.) 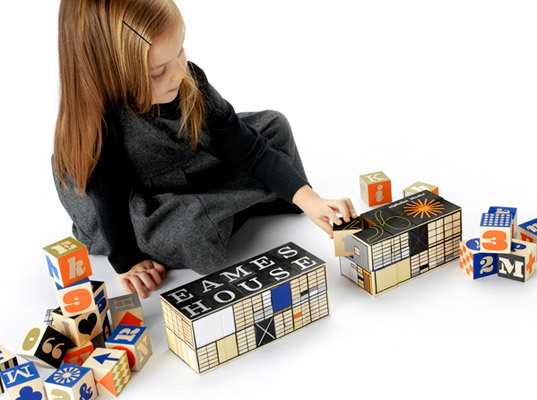 But if G is for Girard, then E most assuredly stands for Eames, another mid-century marquee name that the design house has distilled into a set of alphabet blocks � one that also pays tribute to Charles and Ray's most famous abode.